ONGAWA Engeneering for Human Development is an NGO (Non-governmental organization) which focuses on putting technology at the service of human development in order to build a fairer and more charitable society. We aspire to a world where human rights are protected, respected and promoted while keeping in mind the impact in future generations. To this objective we focus and direct our efforts. 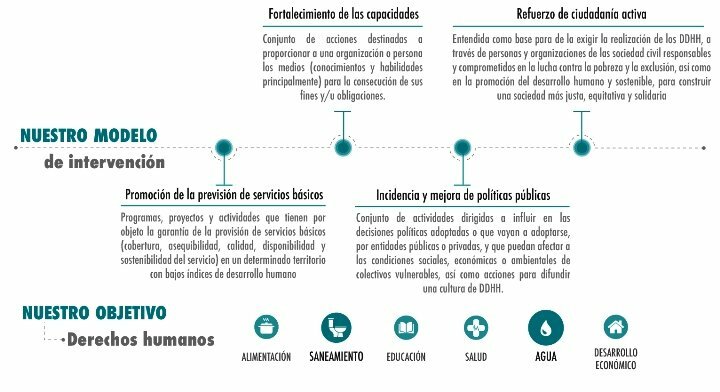 We put people and their capacity to generate change at the core of our work, fighting against inequalities, gender ones in particular, and putting special attention to the most vulnerable collectives. We want an engaged society that works with other social organizations, to promote and demand necessary social changes. We commit to development projects that achieve sustainable results over time. We are an associative project that strengthens itself with the experience, work and the engagement brought together by the people and institutions that shape and support it. We believe that participation, collective reflections and the social, cultural and geographic diversity of those of us who make up ONGAWA enriches our work. We are a collaborative space and a collective that brings its energies together for a society shifting project. We rely on the contribution of 1142 members and 250 volunteers who, backed by a team of 50 professionals and through alliances, networks and platforms we belong to, work with the common goal of putting technology at the service of human development and the battle against poverty. Transparency and accountability are a practice of responsibility towards our social platform (members, volunteers and collaborators), towards all the insititutions (companies, public administration and civil society) who support us and who we partner with in Spain and in the countries we intervene in, and towards all who benefit from our projects. An approach based on human rights is the conceptual framework which legitimizes our actions directed towards human development, as well as the instrument directing them in all phases. We work for the realization and consecution of human rights and, in particular, the Human Right to water and sanitation, and we will achieve this from our sectorial specialization, through the provision of services, the strengthening of capacities, incidence, the improvement of public policies and the empowering of a critical and active civil society in all of the countries we are working in. We are aware that the changes we pursue require partnering and bringing together common forces with other organizations. We partner with public and private entities who share our objectives and ethical criteria, and who we can count on through complementization when it comes to influencing governments and policies or for the development of the objectives we give ourselves. ENTIDADES COLABORADAS ¿TU ENTIDAD QUIERE COLABORAR CON ONGAWA?